Beagle 2 - the robot that will look for signs of life on Mars - has been successfully fitted to its mother ship and is ready for transport to its launch site. 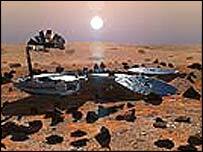 The British-led effort to touch down on the Red Planet is part of the European Space Agency's (Esa) Mars Express mission to be launched in May 2003. The robot lander was fitted to the main spacecraft on Thursday and preliminary test results show the fitting went perfectly. Beagle 2 has now been put into storage and will soon be transported to Baikonur, Kazakhstan, for blast-off. Extensive tests were done when the two parts of the mission were put together in a laboratory in Toulouse, France. A full report is not yet available, but initial results are promising. Professor Colin Pillinger, the lead scientist on the Beagle part of the project, told BBC News Online that he was very pleased with the way the fitting went. "Beagle has been checked and everything is satisfactory. The devil is in the detail, but everything looks pretty good," he said. Beagle 2 is also communicating properly with Mars Express. It is vital there are no software problems between the two craft, as Beagle 2 will be sending data back from the Martian surface to Mars Express up in orbit for relay back to Earth. Many scientists will be watching Beagle's journey closely. Past missions to the Red Planet have had their share of difficulties - about two out of three have failed. But if all goes well, the British robot will parachute on to the Martian surface and hopefully land near the boundary between the ancient highlands and the northern plains in December. As the main spacecraft orbits above waiting to receive data from Beagle 2, the robot will burrow a probe into the red soil, and analyse rocks for signs of water. Recent evidence suggests Mars may have once been warm and wet, much like the Earth, and may have even harboured life. If Beagle 2 can confirm this, it would be one of the most important discoveries of all time. 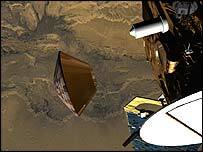 Concerns had been raised that the lander might be too heavy for Mars Express. Beagle 2 is about the size of a washing machine and has a landed mass of 30 kilograms. But the latest results show Beagle 2 is in fact lighter than the scientists thought. Professor Pillinger said: "We predicted the weight two years ago and preliminary readings show it came in 100 grams under." Beagle 2 has now been put into storage and is ready for transport to the launch site at the Baikonur spaceport in Kazakhstan. The launch date has also now been confirmed as 23 May 2003.